This week’s Friday Fave Five is all about E! I mean how could it be not…he is my all time favorite! 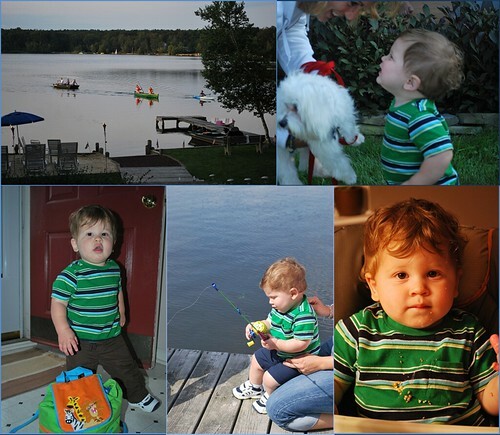 1 – Every summer holiday (Memorial Day, 4th of July, and Labor Day), we head up to my aunt’s lake house. It’s always a blast! It’s so nice and relaxful to sit by the lake and let the kids run around. 2 – E used to be afraid of dogs, no matter their size. But lately, he has been really into them. My cousin had her dog at the lake house and E thought Micky was the funniest thing ever. He was even attempting to walk him! As much as E may love dogs, the hubster is strictly enforcing his no pets policy (minus the frogs). 3 – We have gone all week without a meltdown from E when I drop him off at school (um…daycare). He is finally getting back into a full time routine (he went part time in the summer). He loves his backpack. Every morning, he attempts to put it on his back, but sometimes it’s too heavy. 4 – E went fishing while at the lake house. Even though, he didn’t catch anything, he seemed to enjoy himself. His favorite part: reeling in the line. 5 – See that face. That’s the “I didn’t do it face.” E loves granola bars. Loves them so much, that he smashes them into little pieces and then eats it. I guess he figures he gets more out of it that way. He was quietly sitting in his chair eating his bar and I was straightening up his mess. Every so often, I heard this giggle coming from the car. I walked over and was greeted with this face and the granola mess on the tray. It must be so nice to have access to a lake house. How adorable! I especially love his "I didn't do it" face! What a cutie, I can see why he is the subject of your favorites. Goregous pictures you take!!!! You capture every moment beautifully. The "I didn't do it face" is so cute! How nice that you can head to a lake house and enjoy family time. Great pictures.